Ministry of Law and Justice Govt. of Pakistan 04 Jobs, 05 Jan-18 Express. Government of Pakistan has announced 04 Latest jobs in Ministry of Law and Justice under MP Scale on contract Basis. Job titles and grade are as follows, Monitoring Unit Expert (Grade-III) 02 Posts, Deputy Advisor (R&R) (Grade-III) 01 Post, Deputy Advisor (Opinion) (Grade-III) 01 Post. Maximum age limit for candidates is 45 Years. All posts are on Management Position Scale-III, Pay and Allowances as approved by the Government and other Facilities as permissible under the tules. 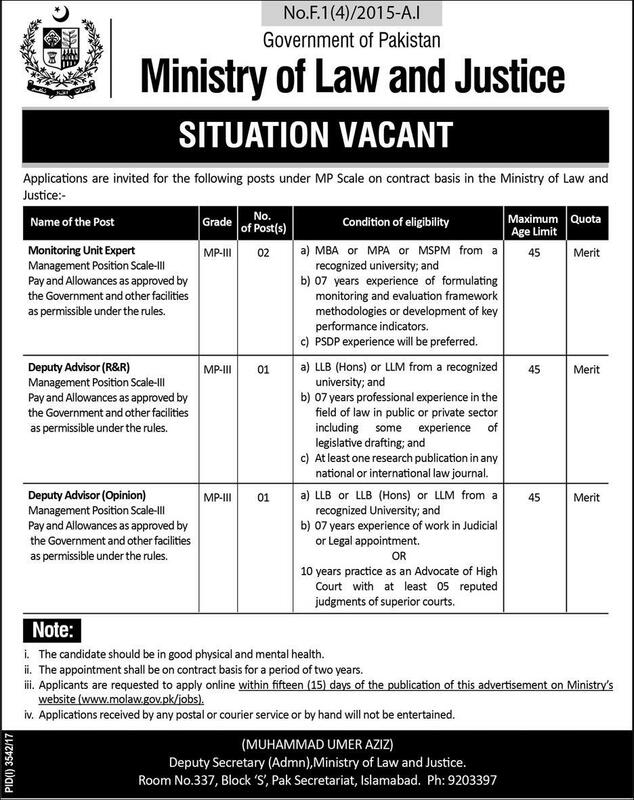 Ministry of Law and Justice 04 Jobs, 05 January 2018 Daily Express Newspaper.